(August 11, 2017)—The Alzheimer’s Foundation of America (AFA) recently celebrated the grand opening of its new Education and Resource Center. 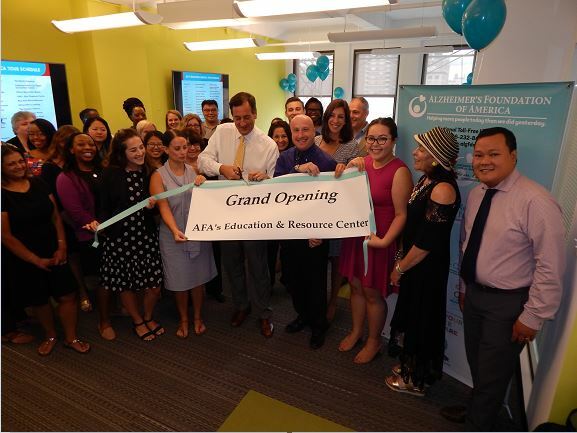 Care partners from a variety of different local organizations and AFA staff joined AFA President & CEO, Charles J. Fuschillo, Jr. in cutting the ribbon of the new Center, located at 322 Eighth Avenue, Suite 800, in Manhattan, in the same building as AFA’s headquarters. The Center will enable AFA to expand the size of its on-site training workshops, educational programs and support for healthcare professionals, family caregivers, and the general public. The programs and services offered in the Center will help people gain a better understanding of dementia, learn effective communication strategies, and help develop relationships with the individuals in their care in order to foster more meaningful living. AFA will also be able to conduct free memory screenings in the Center. The new location is also home to AFA’s toll-free helpline, which is staffed entirely by licensed social workers who provide support and answers to callers and connect them with services in their area, no matter where in the country they live.